The Tiltamax Gravity G2X Handheld Gimbal System uses the same technology as the Tiltamax Gravity 3-Axis gimbal to stabilize camera systems but in a smaller, more compact setup. With a maximum payload of up to 8 lbs, this gimbal is ideal for DSLRs, mirrorless cameras, smartphones, and GoPros. A 14.8V DC in/output port at the base of the pan motor allows for alternative ways to power your gimbal and also provides a way to power external accessories through the gimbal itself. A 5V Mini USB port on the tilt motor allows you to easily power the motor for the upcoming Nucleus Nano remote follow focus. Arri Standard Rosette connections on the left and right side of the gimbal allow you to mount a variety of handles and/or rosette-based accessories to the gimbal. The sliding quick release plate of the Gravity G2X is a standard Manfrotto plate which allows you to quickly and easily slide off of the gimbal and mount to a Manfrotto tripod in no time. 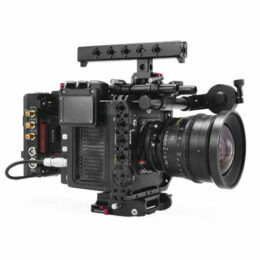 The price is for the gimbal body only. You need either the Gravity G2/G2X Battery Pistol Grip Handle or the Gravity G Series Dual Pistol Grip Battery Handles to power the gimbal body via 18650 rechargeable batteries.